With the holiday’s right around the corner, I wanted to share some of my favorite “little” sensory toys that I love as an Occupational Therapist and mom. Everything on this list can be easily tucked into a stocking or given as a gift this holiday season. The best part about sensory stocking stuffers and fillers are that they’re very budget friendly, but that doesn’t mean they can’t pack a big punch. The toys on the list can make a drastic difference in your child’s ability to pay attention, unwind after becoming dysregulated, and/or provide an outlet for the sensory input their craving. Plus, most are appropriate in both school and home settings. 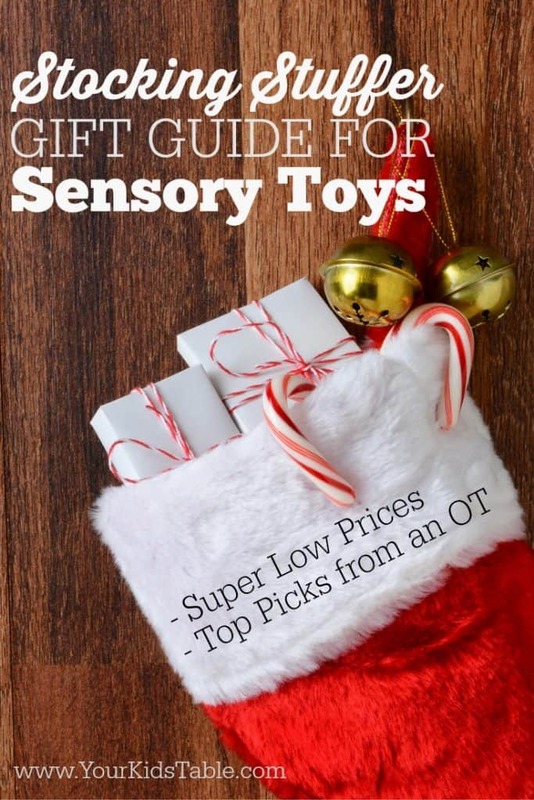 Of course, a good deal of the sensory stocking stuffers on this list give input to more than one of the seven senses (don’t forget about proprioception and vestibular), but I’ve grouped them together by the sense they tend to give the most input to. That should help you focus on what stocking stuffers will work the best for your child. As always, with all sensory activities, NEVER force your child to participate in anything they don’t want to, sensory input is unique to each and every child. What they’re experiencing could be extremely uncomfortable. Respect their boundaries, while gently challenging them. 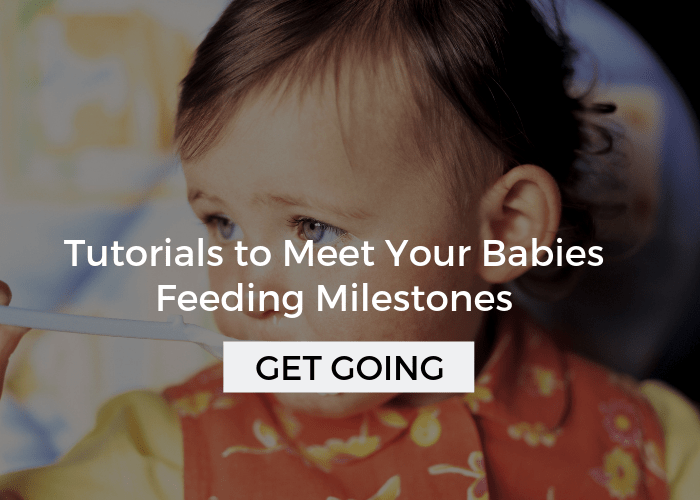 Take it nice and slow, in little baby steps if need be, helping them to get comfortable with new sensory input over time. 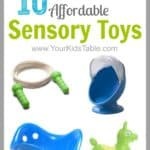 Sensory Stocking Stuffers and Fillers: All 7 Senses! Each stocking stuffer below has a link accompanying it, many of those links are for products that I use myself or are very similar to ones I use. Also, please note, this post is written from the perspective of a parent looking to support their child’s sensory needs. That could be applicable for a child with Sensory Processing Disorder, as well as other diagnoses, OR for children that have no diagnosis at all, but display certain sensory needs. At the same time, these suggestions are also applicable for any child without any apparent sensory needs, because sensory stimulation greatly encourages and supports any child’s development. Affiliate links used below. See our full disclosure. Oral sensory includes our sense of taste, proprioception (specifically in the mouth), and tactile (the way textures feel in our mouth). Great for kids that like to chew or mouth on various objects (sometimes, objects we don’t want them to!) 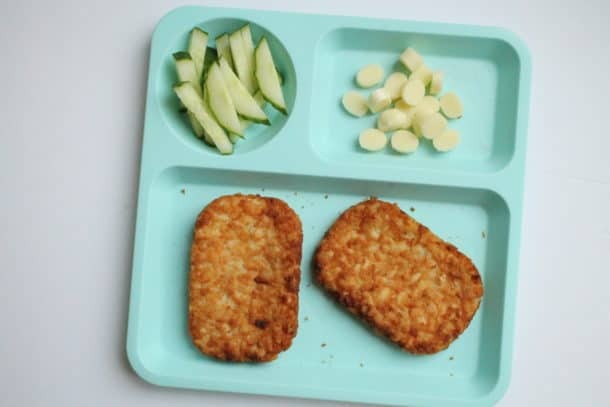 Also, if your child is a picky eater as a result of sensitivity to textures, the types of sensory stimulation here might help to increase the variety of foods your child eats when used consistently for at least several weeks. If you want to learn more about the oral sensory system click here. Chewy Jewelry – One of the best ways, to help a child that chews on EVERYTHING is to give them a necklace or bracelet they can chew on whenever they need to *that looks like regular kid jewelry*. This allows your kid to get the input they need without chewing up their shirt sleeves, pencil tops, books, etc. Chewigem has a huge selection of stylish and durable options. Animal Jigglers – These shaking sticks with rubber animals on top of them are one of my go-to therapy items. They are designed to be chewed on, and can be turned onto vibrate. The vibrating input can be used to calm or energize, and most often tends to decrease sensitivity to the mouth (I’m talking about kids that don’t like the way certain textures feel in their mouth). I’ve worked with many kids that loved these things and used them daily. Vibrating toothbrush – I love vibrating toothbrushes because they are sooo easy to include in the daily routine, because you’re brushing your kids teeth anyways. Swipe out the regular tooth brush and your kiddo will get lots of sensory input as they start their day or before bed. One word of caution: vibration can be very intense, if your child is unsure, take it slow, letting them gradually get used to it over time. Gum – With a few rules, your child can learn to chew gum appropriately and discreetly. Usually kids around 4-5 and up are able to handle that, sometimes even younger. That’s a judgement call you’ll need to make, but allowing your “chewer” to chew gum can be very helpful! The link here is for an all natural gum that comes in a variety of flavors. Chewy Pencil Toppers – Stick these rubber tops on top of your kids pencils or pens and give them a safe way to chew! 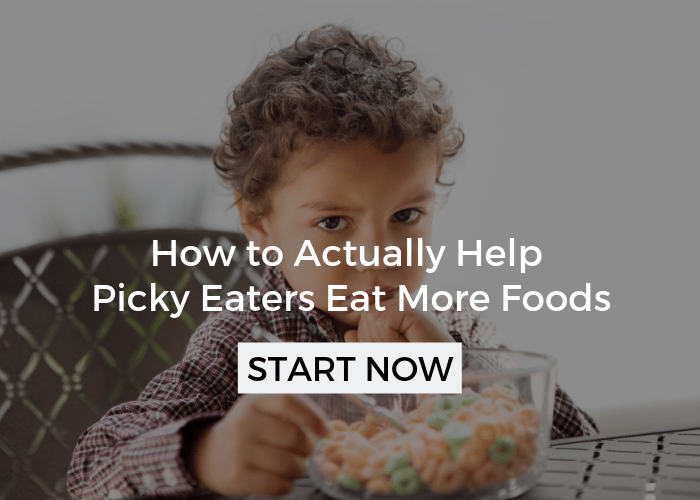 FunBites – One of my favorite tools for picky eaters. These cutters come in a variety of shapes and cuts food into cute, neat little shapes that really help some picky eaters because it minimizes textures and gives them uniform bites. While this isn’t a traditional “sensory” toy, a lot of kids with strong food-sensory preferences have responded really well to this cutter, mine included, and that’s why its a must on this list! Tactile is all about what we touch, and if your kid likes touching and exploring different textures they’ll love the ideas here. Or, if your child is sensitive to touching different textures, these stuffers could be introduced slowly to decrease their sensitivity. Discovery Putty – This stretchy putty has hidden little objects in it that encourages digging through it for a more intense tactile experience, as well as working on fine motor skills and giving proprioceptive input, too! Not-Sticky Playfoam – Another staple in my therapy bag, this clumpy foam that you think is sticky, but isn’t, is an awesome and low mess tactile activity. Pull and Stick Bouncy Balls – These unique balls that you can stretch, squeeze, and bounce will stimulate not only tactile, but proprioception and vision, too! Scented Stress Balls – Every time my son goes to school he has a stress ball in his pocket, which he requested himself. He knows he can’t pull it out, but when he needs to he puts his hand in his pocket and gives it a squeeze. These can be used in all sort of settings, and this one comes in a variety of scents, which is obviously stimulating to the smell sense as well. Our kid’s sense of smell tends to run under the radar unless you have a kid that is seeking smell! Smell seekers often smell their way through their environment, and at times it can be disruptive or even inappropriate. If you have a smell seeker, you’ll want to provide an outlet for them to smell (the list below is a great start). 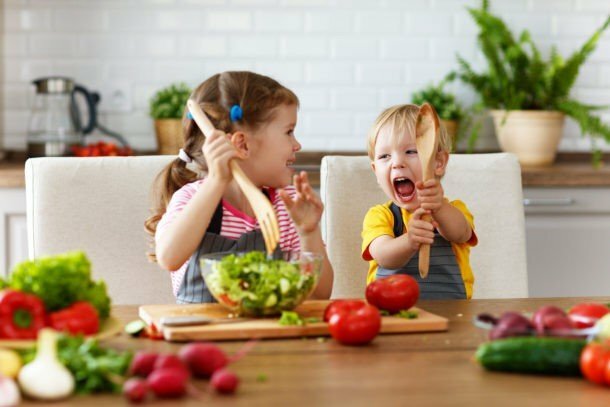 If your child seems to not notice smells or avoids them, it could have a big impact on their eating because smell is such an important of that. In that case, you’ll want to stimulate and offer smelling activities. Scented Putty – Get tactile stimulation and the calming affects of lavender all at the same time! Scented Markers – My kids favorite markers in a variety of scents! Scented Lotion – Any type of lotion or even shampoo you use can stimulate or calm, depending on the scent you use. Generally lavender is calming and citrus is stimulating. Smell seekers will be happy to smell any scent though! Essential Oil Roll On Stick – I recently got this roll on stick for a blend of essential oils, and I love it. This particular blend smells gentle but wonderful (I’m sensitive to smells) and helps relieve stress and headaches. I can personally vouch, that it does both. The roll on sticks makes it really easy to use for kids. Essential oils are an enormous topic, if they are new to you, read more about them here. Hand Held Spinning Light Up Wand – While very common these spinners can provide lots of visual stimulation in a pinch. We often have one laying around our house. Changing Color Night Light – My little one loves his little color changing night light, one of my favorite toys he got for his birthday. No cord, portable, and great for use at night or in calm down tent. These lights are softer, and change colors slowly, having a relaxing effect. Optical Illusion Images – Looking at high contrast images can be great for visual seekers looking to decompress. The link here is for a book, that will be a tight squeeze in a stocking, but you could shove it in! Often referred to as Auditory, as with every sense kids may seek out noises or avoid them, and sometimes kids love to be the one making noises but don’t like unexpected noises like a fire truck whizzing by. Even if your child is sensitive to noise, you may want to consider these toys to help slowly break down some of their sensitivity. Shaker Eggs – A subtle sound that doesn’t make parents crazy, but allows your child to still stimulate their auditory sense. These eggs are great for kids sensitive to sound too, which many are, because they make a softer, soothing sound. Pop Tubes – When I was traveling to homes as an early intervention therapist, I always had a few pop tubes in my bag. They compact down in an accordion shape and make an interesting and motivating noise when you pull the tube open. They also connect together and can be yelled into to make silly sounds. These are great for bilateral hand skills (using both hands together), which some kids with sensory differences have a hard time doing. I love these inexpensive toys! Whistles – Another item you would also find in my therapist bag – great for oral motor strength too! This sense is all about our sense of motion, balance, and movement! Yoga Cards – So vestibular toys are really hard to fit into a stocking, BUT one of the best ways to give your kid’s vestibular system really incredible input is through yoga. Even if you’re a total novice, these cards make it really easy for you while motivating your little one. I highly recommend these for kids that are sensitive to movement or dislike climbing because these positions will actually improve their vestibular processing, which is oh so important. And, if you have a vestibular seeker, yoga poses will give them great practice in getting their needs met in a controlled, calming activity. This is a win – win, so even though I only have one vestibular stocking stuffer to share, it does hit all the marks in a big way! Proprioception is a little known sense, but is the most common form of input that sensory kids seek. This sense allows us to know where are body is at all times and we stimulate it by compressing, stretching, and pulling our muscles and joints. Hand Held Vibrating Massager – If I had to pick my top 3 sensory toys, this would make the cut every single time. Vibration is an incredibly intense form of sensory input, that many kids love and seek. This little massager is cheap and children can use it from a very young age independently. I like to put these in a cool down tent or even recommend keeping one in your purse if your child needs some input while your out in public. You can rub it on their back, legs, and arms slowly to relax like a massage, or if your child needs a pick me up, you (or they) can use it in short bursts, putting it on and off their body quickly. Vibration stimulates the tactile and vestibular systems too! Tactile Bean Bags – The weight of bean bags gives a lot of proprioceptive feedback as kids catch and throw them, these have the added benefit of different textures on each one to also stimulate the tactile system. Handheld Weighted Balls – Think your child would prefer weighted balls as opposed to bean bags? These would give very similar input and could be added to the bottom of a book bag. 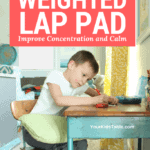 The extra weight your child carries could be calming and organizing to them. Just know that after carrying an added weight for 15-20 minutes your child’s body will habituate to it, and it will have little effect. 8. Bonus All Senses Stocking Stuffer! Sensory Diet Cards – If you’d like to give an out of the box sensory stocking stuffer or filler, that includes sensory input for all 7 senses and is totally customized for your child’s needs then sensory diet cards are the perfect thing. I created this set of cards to be versatile for a wide range of kids and they include some of the most powerful sensory activities. When you snag these 60 sensory diet cards you’ll be able to print them, cut them, and stuff them right into a stocking. Your child can use these to help them find sensory diet cards that meet their needs, that likely change day in and day out. You can even put magnets on the back to stick them to the fridge. You can grab a set here. Feeling inspired? What are you most excited to give your child? Tell all of us in the comments below, we love hearing from you! Then, make a list of the items you think your child will respond to, choosing some from senses they seek and from some they avoid, so that you can address any sensitivity they might have, too! 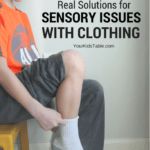 If you’re new to sensory processing, the topic can be quite overwhelming to say the least. 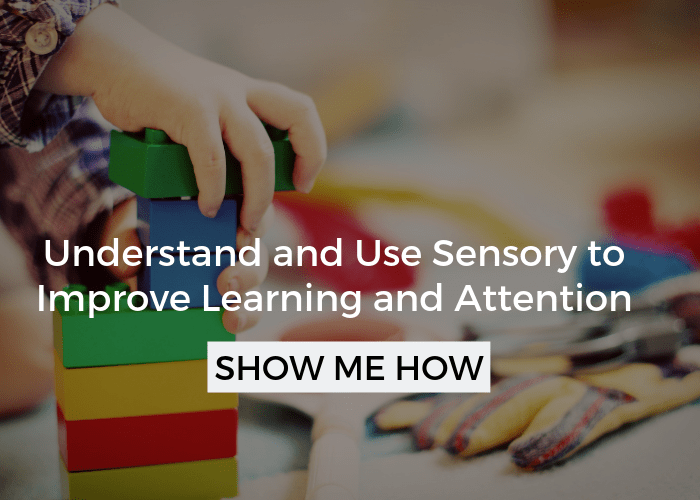 Click here to join my newsletter and get more sensory resources. As soon as you sign up, you’ll get a FREE Printable: 21 Sensory Red Flags You Might Be Missing (I’ll put it right in your inbox). Might want to stick this on your sensory or holiday board! 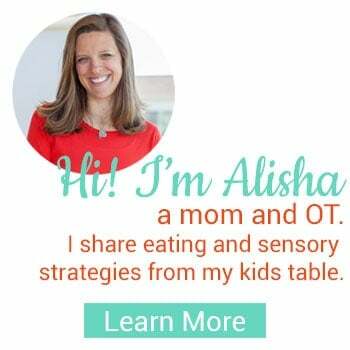 Alisha Grogan is a licensed occupational therapist and founder of Your Kid’s Table. She has over 14 years experience with expertise in sensory processing and feeding development in babies, toddlers, and children. Alisha also has 3 boys of her own at home. Learn more about her here. Sensory Tricks to Help Your Kid Fall Asleep Fast! Hi! I have really enjoy your work 🙂 I need help to teach a little guy (19 months old) to eat. He has several disabilities but one of them is a visual disability and he doesn´t eat by himself. Could you recommend me some biography o sites to visit? Free tips and strategies sent straight to your inbox! Great! Your guide is on the way! 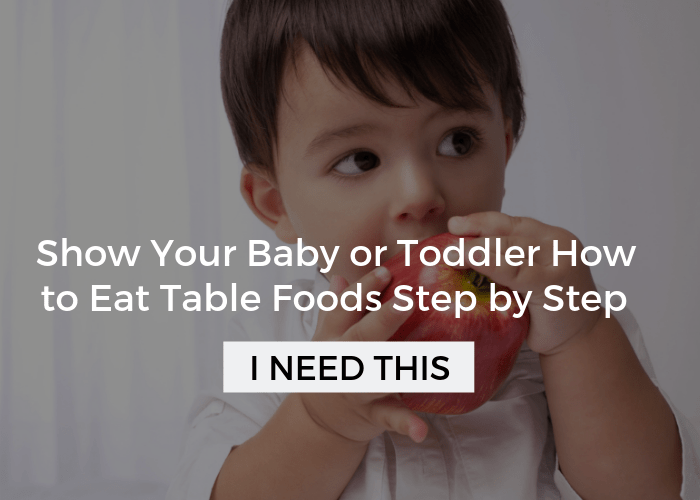 Free Baby Won't Eat Table Foods Printable!